Honesty Day is an annual observance in the United States celebrated on April 30. It was created in the early 1990s by M. Hirsh Goldberg, a novelist and former press secretary of Maryland. In 1991, Goldberg published “The Book of Lies” which describes the lies that are told everyday as well as frauds, fakes and scams that have changed the course of history. While writing the book, he came up with the idea of Honesty Day to encourage people to remain truthful. Goldberg chose the date of April 30 because on the first day of that month, April Fools' Day is celebrated. While April 1 celebrates falsehood and is full of pranks and lies, April 30 celebrates honesty. On Honesty Day, any participant may ask a question, and the person who has been asked is expected to answer truthfully and straightforwardly. Besides, this day is a campaign for urging politicians to remain truthful and stay away from lies. It reminds of the consequences of the most deceitful lies in history such as Dreyfus affair, Ponzi scheme, and Watergate scandal and commemorates truthful political leaders such as Abraham Lincoln and George Washington. 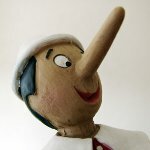 According to various surveys, the average person lies at least several times a day, including white lies and omission. People have lied from the beginning of times, but this does not mean that lies should be encouraged.